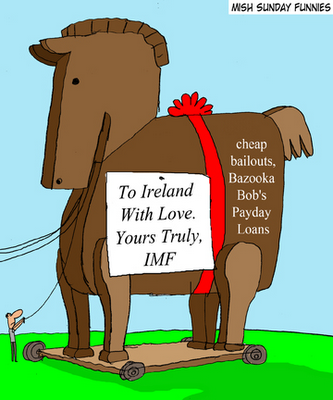 As the IMF prepares to send in the Trojan Horse this evening to "save" Ireland banks, people are starting to wonder what would happen if some banks around the world were actually forced to take some losses and not give out record tax payer paid bonuses this year? That answer can be clearly seen in the example of Iceland, a country whose debts overwhelmed them during the financial crisis but decided not to bail out their banks. Iceland’s President Olafur Grimsson said his country is better off than Ireland thanks to the government’s decision to allow the banks to fail two years ago and because the krona could be devalued. Iceland’s banks, which still owe creditors about $85 billion, were split to create domestic units needed to keep the financial system running, while foreign liabilities remained within the failed lenders. As a consequence, “Iceland is faring much better than anybody expected,” Grimsson said. Wait a minute? I don't understand? There is still a country there? It did not explode as we have been told will happen here in America? How unfortunate for their people that they are not taxed to pay for a Goldman Sacs and Bank Of America to give out exorbitant pay. Fortunately, there will be no more Iceland "tragedies" moving forward as the IMF (a group of bankers) is sending in the Trojan Horse to Ireland (to save the bankers) as we speak.